Secrets in the Walls (2010) is a made-for-TV movie, starring Jeri Ryan as ‘Rachel Easton’, an obnoxiously smug and obtuse single mother, who moves her two young daughters into an old, creaky house in the suburbs, to be closer to the hospital where she’s recently started working, and inadvertently delivers them all into the clutches of an angry, vengeful ghost! Eep! In case you couldn’t tell, I didn’t warm to Rachel very much. 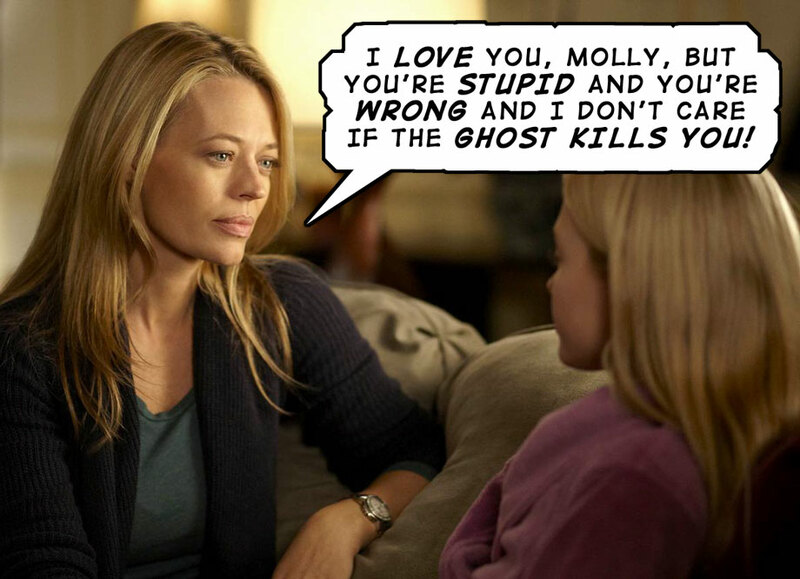 Her youngest daughter, ‘Molly’ (Peyton Roi List), has the ability to predict when a phone is about to ring, and yet her mother just shrugs this off as an annoying habit she needs to grow out of, rather than evidence of an incredible psychic gift! Obviously a story like this one requires the protagonist to be fairly sceptical at first, for the sake of suspense and dramatic conflict… but since we, the viewer, can clearly see the ghost as it preys on her eldest daughter, ‘Lizzie’ (Kay Panabaker), it’s incredibly irritating to have to wait so long for Rachel to catch up and accept what Molly has been telling her since the day they moved in. In fact it takes almost an hour of screen-time for her to stop fobbing her daughter off with condescending platitudes, and actually take her terror seriously! It might not be so bad if Rachel were surrounded by other sceptics, but her co-worker (boss?) at the hospital, ‘Belle’ (Marianne Jean-Baptiste), is a practising medium, who often talks to spirits in order to reassure her patients. Maybe if Rachel had actually bothered to invite her around for dinner sometime, instead of just expecting Belle to listen supportively to all her whining and tell her what a great mother she is, then this whole mystery could have been wrapped up a lot sooner! Gah! On the other hand, Belle turns out to be a pretty shoddy psychic all around… unable to tell two spirits apart, or cleanse the house properly once they finally figure out who exactly they’re trying to exorcise! She can’t even explain (to Rachel or the viewer) why laying the bones of ‘Greta’ (Jordan Trovillion) to rest only seems to make her ghost more active and powerful… all Belle does is shrug and say “Well, sometimes things don’t always work out the way we want them to”. Yeah, thanks for that. Tch! As for the performances: Rachel and Lizzie were written as such irritating characters, it was impossible to dredge up any sympathy for them, or any real warmth for the actresses lumbered with playing them. To be fair to Rachel, at least she’s consistent… in the final scene we see that she’s just as smug and insufferable as a believer, as she was as a sceptic. Molly was by far the most sympathetic character, and I thought List gave a solid, committed performance… apparently this isn’t the first time I’ve seen her either, as she’s also had minor roles in Confessions of a Shopaholic, Cashmere Mafia, and 27 Dresses! But let’s not hold that against her, eh? Apparently Jean-Baptiste has an Oscar nom to her name, so this reactive supporting role was totally beneath her. I’ll admit there were a few creepy moments that gave me a bit of a chill, as ghost stories often do… but overall, meh. This entry was posted in Rants about Films and tagged Jeri Ryan, Kay Panabaker, Marianne Jean-Baptiste, Peyton Roi List, Secrets in the Walls. Bookmark the permalink.